Shocker, New York City is massive. Therefore, there is no way that you will be able to see everything that this amazing city has to offer in just a weekend (I’ve lived here for over thirty years and still haven’t seen it all). But don’t let this deter you can see a ton of amazing sites in just 48 hours in NYC. Now if you’re reading this, then you’re probably here from out of town. Therefore, I will stick to central Manhattan since this area contains some of the most iconic buildings and attractions that New York City has to offer. So we’ll start your trip off right with breakfast from Ess-A-Bagel on 831 3rd Avenue. They have the perfect bagels and an amazing assortment of cream cheese options to choose from. I usually get the cinnamon raisin bagel with the chocolate chip cream cheese, but their strawberry cream cheese is also really good too. 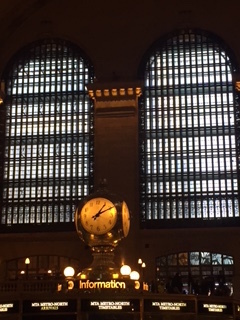 After you’ve fueled up, let’s hit the ground running and head over to Grand Central Terminal. This building is famous for its pale blue ceiling that is studded with a series of eye catching constellations that mimic the night sky (free tours of the building are available if you’re interested). Now I know we just ate but there is an awesome food court downstairs that has a Shake Shack and a Magnolia Bakery, among other things. Whatever you do, get the Banana Pudding because it is insanely awesome. Next, we’ll walk along 42nd street, towards 5th avenue. 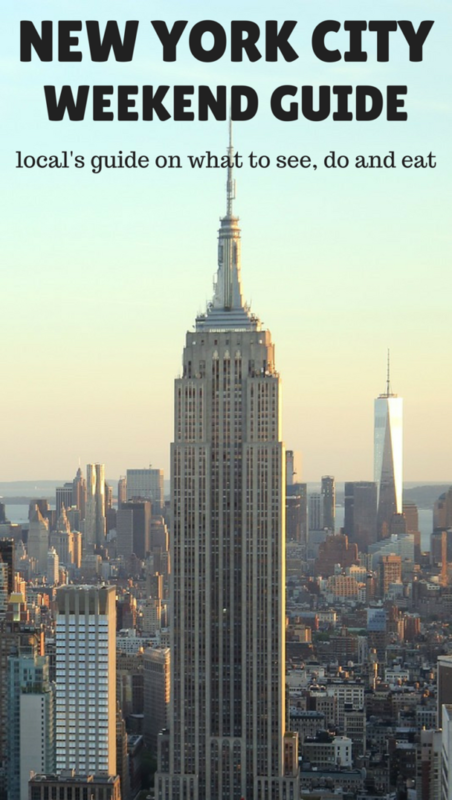 On the way, you’ll be able to see the Chrysler Building and the Empire State Building. While the view from the top of the Empire State building is amazing, the line is incredibly long and the tickets are incredibly expensive so I wouldn’t recommend it. (Top of the Rock is also a popular place to catch a bird’s eye view of the City). 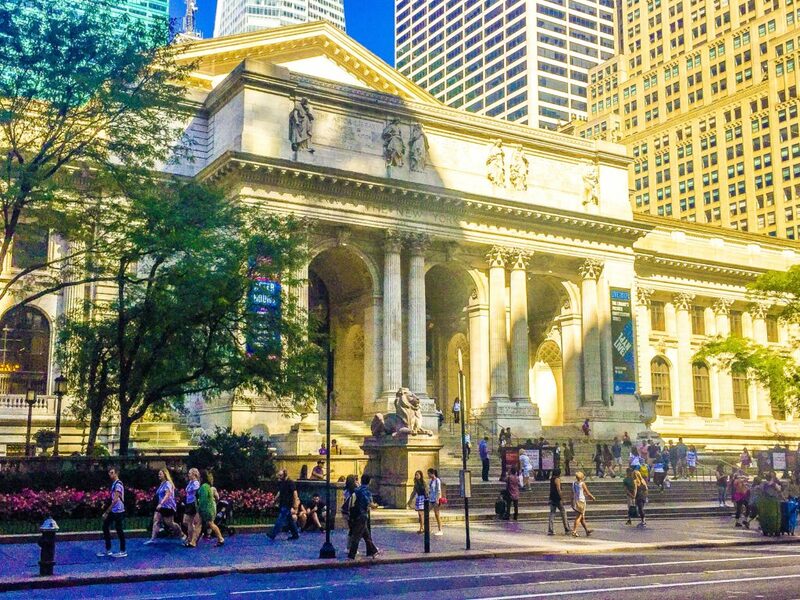 On your left, you’ll see the New York Public Library, an amazing spot to take a picture but be sure to go inside and check out some of the awe inspiring artifacts like the first book every printed, the Guttenberg Bible. 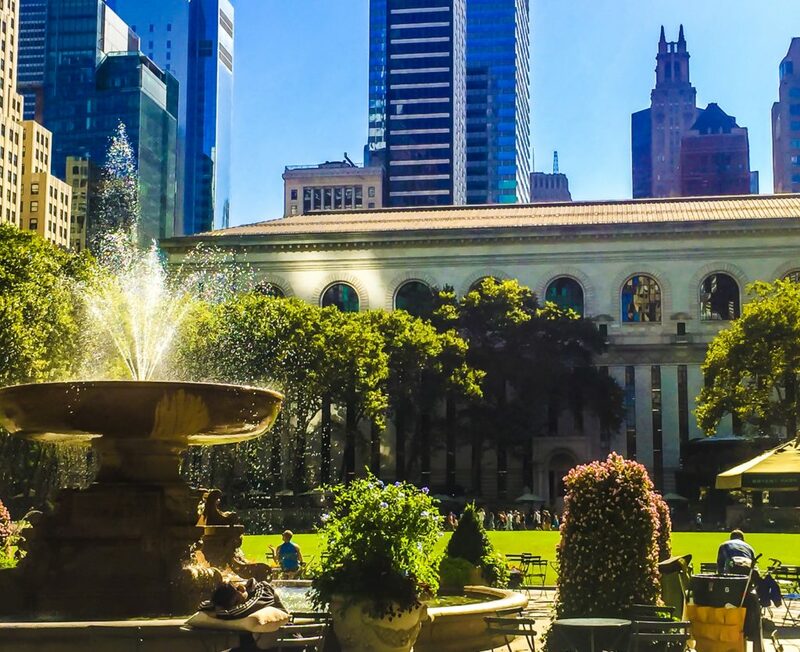 After you’ve had your fill of the library, be sure to stop for awhile and take in the greenery at Bryant Park. Not only is it a great place to people watch, but you can play ping pong, check out some magazines from their library, or hop on the Carousel for a truly enchanting experience (as long as it’s not too cold). Next we’ll keep walking down 42nd street and head into Times Square. Honestly, I am not a huge fan because it is VERY touristy, so I wouldn’t buy or eat anything here since it’s overpriced and just not worth it. Therefore, I would snap a few pictures and get out of there. ***The only reason to stay in Times Square is if you want to see a Broadway Show. Just hop on the TKTS line in Times Square and get half price tickets for Broadway shows that evening. From here we’ll walk up 42nd and turn left onto 5th Avenue; you’ll know you’re going in the right direction if the street numbers go up. On the way up 5th Avenue you’ll see Rockefeller Center, St. Patricks’s Cathedral, Saks Fifth Avenue, the Plaza Hotel, and eventually hit Central Park. ***If you enjoy a nice afternoon tea, the Russian Tea room is close to Central Park West and serves an amazing afternoon tea. Just be sure to make reservations since this restaurant is an icon in New York City. Once you’re in Central Park, Bathesda Fountain is the most picturesque part of the park, so you’ll definitely want to snap a photo with the iconic Tavern on the Green in the background. 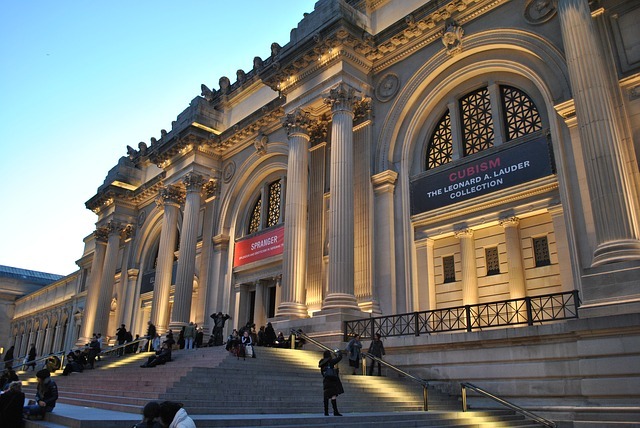 From here, you can explore Strawberry Fields or head to The Metropolitan Museum of Art (MET). I adore the MET and go all the time because the price is pay what you wish. To get there, just walk along Fifth Avenue, on the east side of Central Park, and if you’re here on a Friday or Saturday, the MET stays open until 9:00 pm so you’ll have plenty of time to explore. Since you have a limited amount of time, I would enter the MET and head right towards the Temple of Dendur, one of the most famous and photogenic spots in all of New York City. From here, head upstairs and take in the beauty of the Contemporary art collection. Since you’re in the area anyway, cut across the park and stop at LeVain Bakery on 167 W 74th Street, for some of the best chocolate chip cookies in the entire city. Head towards the river and walk through Highline Park, taking in the vibrant glow of the city at night. Not only is it a beautiful park, but there is some gorgeous street art here that you can check out along the way (the park doesn’t close until 10 pm so this is a fun place to explore at night). For day two of this weekend New York City itinerary, we’re going to head to Lower Manhattan and start out at the iconic Flatiron Building. 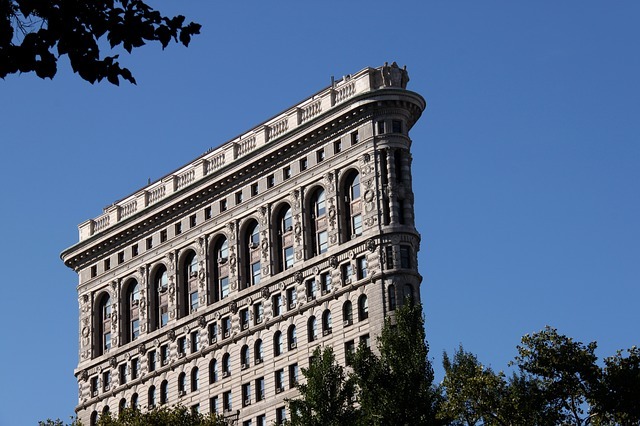 You can get off at the 23rd street metro station and explore this iconic building, as well as Union Square Park and Union Square café. They have a great brunch that includes butterscotch donuts. ***If you have time, definitely stop at Union Fare on East 17th Street and get a birthday cake croissant. It oozes rainbow sprinkles and is everything good in the world. You will need all that brightness because next we will be exploring the somber but totally amazing, September 11th Memorial. This monument it a stark and austere commemoration of all those who lost their lives on that tragic day. Depending on your interests, you can also check on the September 11th Museum. Skip the line and book your September 11th Memorial and Museum Admission here. From here, depending on how hungry you are, you can stop at Eataly for some of my favorite pizza and pasta in the city. This restaurant and grocery store combo was created by none other than Mario Batali so you know the ingredients are fresh and that the food is delicious. 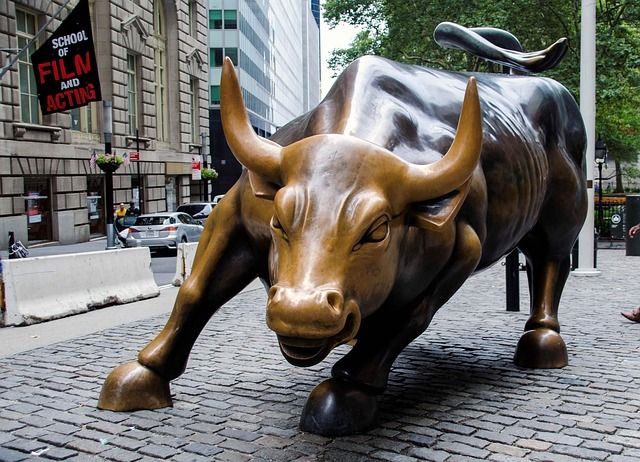 After you’ve had your fill, walk on over to Wall Street, see the Stock Exchange, and the Charging Bull statue. After you’ve gotten all the photos you need, you are just a short walk from Battery Park. Take a walk along the river, hop on the seaglass carousel and see the vastly underrated Irish Hunger Memorial. But before you call it quits for the night, be sure to catch the free, Staten Island Ferry. I like taking the ferry at night time because you get a great view of the iconic, Statue of Liberty and Ellis Island for free. So while you won’t be able to see all that New York City has to offer, this 2 day itinerary will help you to explore some of the most notable buildings and attractions that make New York City one of the most vibrant and exciting cities in the world. If you only have one day in New York City or want to explore at a more leisurely pace, then check out my itinerary for a day in NYC. Author Bio: Kelly currently lives and works in New York City. She has a passion for solo female travel in Europe and hopes to one day quit her job, travel the world, and continue work on her blog www.girlwiththepassport.com. Have more than 2 days in New York? Check out this 3 day NYC itinerary. Looking for an affordable hotel in NYC? Check out this list of the best affordable hotels near Times Square. Looking for more affordable food suggestions while in NYC? Check out this list of 20 Cheap Places to Eat in New York City. 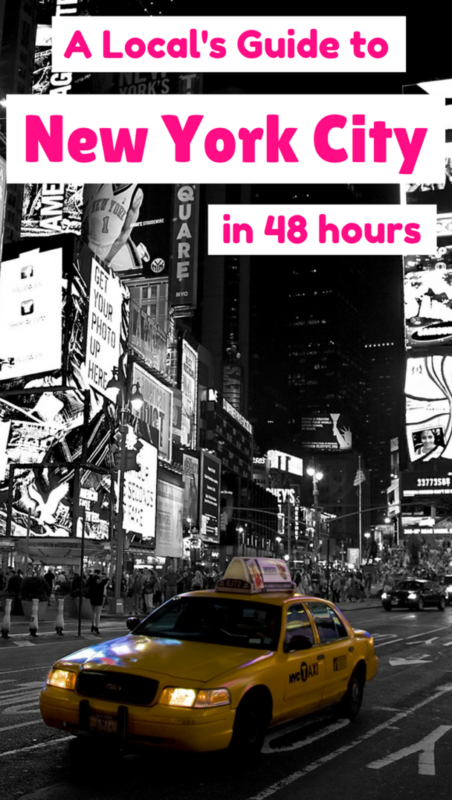 This is one of the best 48hr itineraries out there for NYC. MoMA is a great place to visit too, admission is free every Friday, 4–8 PM! This would have come in handy the last time I was in New York. We only had a day and there was so much to choose from! 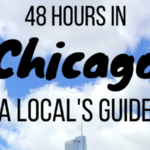 Thank you for this guide by locals! It’s always best to follow locals as they know the best stuff in a place! I’ll definitely follow this guide if I have only a weekend in NYC! Great itinerary. I love Battery Park. It’s usually one of the first places I stop by when I’m in NYC.